I mixed this all together and set aside a lid. Each day for seven days I then added a teaspoon of sugar and a teaspoon of ground ginger. This was a thrill, another aspect of slow food that I just love. So after seven days I strained the ginger plant. Here I am using a funnel and some scrap material. 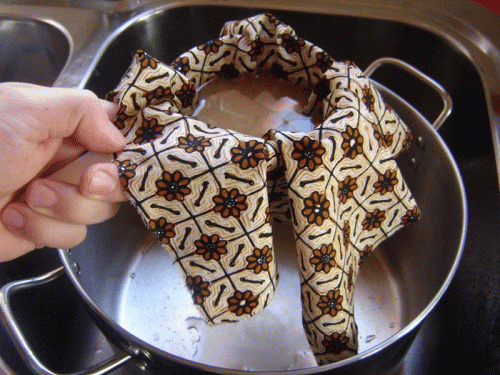 Recipes suggested muslin or a looser weave. This worked okay I think, just squeezed it out tight. You are left with a clay like substance that you can halve and continue to grow another plant. I suppose I could keep the plant and continue to grow it for 40 years. Maybe that could be the only inheritance for the kids. Or all the inheritance goes to the kid that took the plant. Oh well, I digress. Next I added 3 cups of sugar to 20 cups of water. Our cold rainwater just dissolved the sugar fine after a bit of stirring. I used raw sugar for a nicer colour. I mixed in the ginger plant solution. 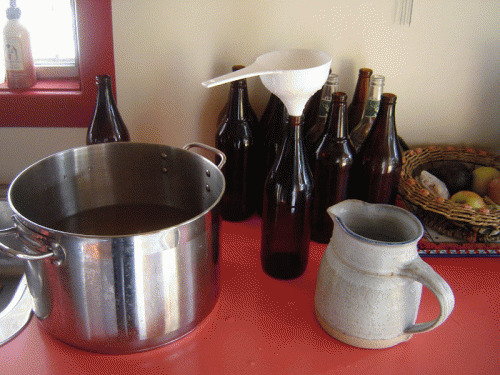 Adding 1 tsp citric acid to the mix before bottling is a good suggestion for getting more bubbles. Sterilise the bottles (Thanks Matt), then fill them. Plastic ones can be used too, I just like these and my bottle capper. I then capped them with my capping machine. Next is the 2-3 week wait till they are ready. I put them in a plastic crate in a cool, dark place. The crate has a lid, in case they decide to pop as so many people are happy to tell me will happen. I will update this when they are ready to tell you how it went. I hope this inspires you to have a go. This is what happened in times before Coca Cola. UPDATE 23rd Oct 2008: This went well, it is this slow food mentality, because of the effort and time you put in, you savor the product more. My last batch was too sweet, this one had a nice sugar/ginger balance. I am a bit disappointed about the bubbles, I wanted more, I have to get the yeast consistently working. I remember my grandparents ginger beer, I suppose after many batches you get to a drink perfect for you, that is what they had done. Good luck. This is very like the recipe my dear late mother used to make for us as kids. She would make ginger beer spiders for us inthe summer.......DEEELICIOUS.I'm looking to my first brew. The reason you arent getting the fermentation (bubbles) is because the bubbles are caused as the ginger 'Plant' ages....so if you start a new one every time then it has to start the fermentation process afresh each time....so that it doesnt have a head start for each batch. Also...dont leave it stand after bottling and before capping... if you cap it straight away you wont loose the initial 'bubbles' as the mixture settles. Be careful of sanitation - probably best to use a steriliser on everything that you are putting in contact with the brew. Another thing is that the jar is probably not best to be open to wild yeast as that could hurt the brew and add funky flavours depending on the yeasts and bacteria that come in. This is from a standpoint of brewing beer. Would be quite cool to try brewing this with a certain strain of yeast too like US-05 or similar which would make an alcoholic ginger beer! 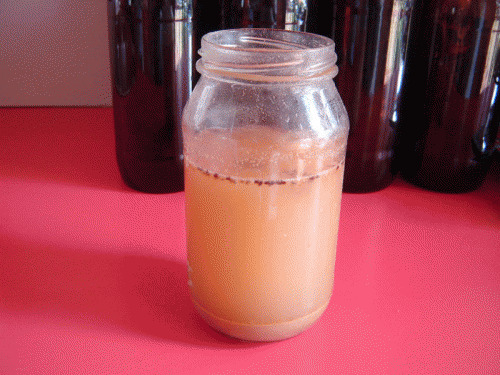 This is certainly not the ginger beer plant culture, because the real one consists of Saccharomyces florentinus and Lactobacillus hilgardii. You used only yeast. I wonder if anyone can tell me how to make diet ginger beer, I am diabetic and remember my mother used to make it but cant have the sugar now I thought maybe using powdered sweetner might work can anyone help me? 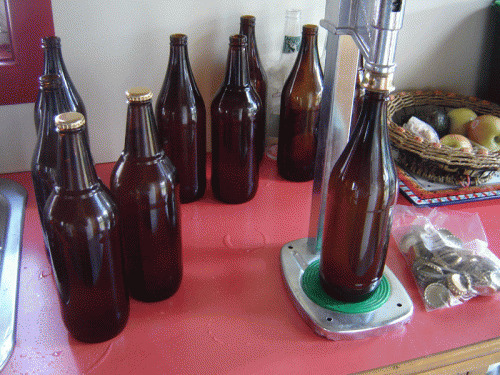 For more bubbles you simply need to prime the bottles before filling, add around 1 teaspoon (5ml)to each bottle. This will allow the residual yeast in the liquid to feed and produce carbon dioxide dissolves into the liquid. You do end up with a small amount of sediment, but that gives you B vitamins without buying supplements (or you can be careful when pouring). After 7-10 days you have a nice fizzing ginger beer. Some of your feedback is just plain crazy. Having made homemade ginger beer for many years I can assure you that your recipe is exactly the way I made it, with the exception of the citric acid. Instead of the acid I used the juice of 1 or 2 lemons. My first plant was half of an old plant from a friend. The resulting mixture was quite volatile and had to be chilled in the fridge overnight or the contents exploded out of the bottle when opened. For the diabetic, maybe she could use a sugar substitute. I would like to know how this works.